Still from Bight of the Twin. When we think of Voodoo, pin-pricked dolls and face-painted men in top hats shaking a stick might come to mind. But now, thanks to an unlikely disciple, the truth about the ancient West African religion (also known as Vodoun) is coming to light in a new documentary. 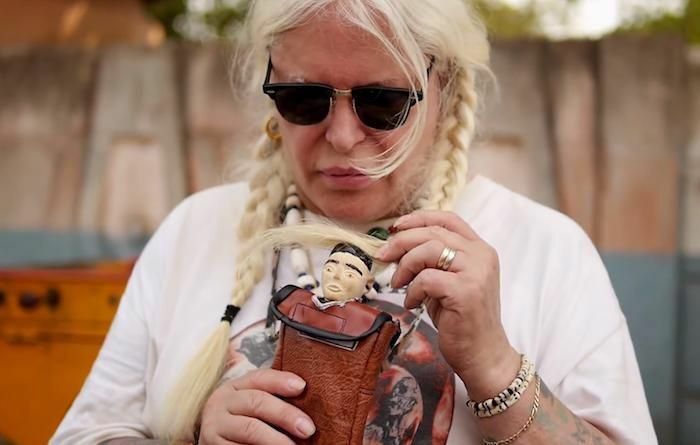 Psychic TV singer and Throbbing Gristle co-founder Genesis P-Orridge stars in Bight of the Twin, which follows the artist on a trip to the annual Vodoun Twin Festival in Ouidah, Benin, a city that's known as the birthplace of the religion and supposedly the place with the highest birthrate of twins in the world. As the doc's synopsis explains, twins play a prominent role in the Vodoun belief system and are "venerated as Gods...and when one twin passes away, the living twin remembers its spirit by carrying around a small, carved replica of their dead brother or sister, called a Joumeaux." In the film, P-Orridge (who refers to themselves by the pronoun "we") takes part in a "twin fetish ritual," allowing h/er to reconnect with h/er late wife -- and partner in their famous Pandrogyne project -- Lady Jaye Breyer P-Orridge. To this day, P-Orridge carries a Joumeaux doll around their neck to represent Lady Jaye. We had the chance to chat with P-Orridge about the documentary, which was directed by Hazel Hill McCarthy III, offering Fanta to the gods and why Vodoun is chronically misunderstood in the West. First of all, I heard that you were in West Africa shooting part of the documentary during the Ebola scare? Yes. Two of the crew dropped out the night before we left. Pathetic. My answer to that was, "Really? Think about it. If someone were to make a book or a film about your life there could be two endings: the first is you're a miserable old man in an old peoples' home, forgotten and shaking and lonely. Or you died of Ebola making a film about Voodoo. Which is a more interesting ending?" The [crew] said their parents didn't want them to go but it was 2,000 miles to the nearest possible case. What was it like the first day you arrived? The first day we walked around the market. After the twin festival ceremony for dead twins in the town square, we traveled around with the drummers and the chanters and it was all very up and happy. Everyone was grinning. We arrived at the temple of the twins and they made a prayer for Jaye here. The deity is a trough of the remains of decades of offerings of candies and Fanta. The women all run these ceremonies, one is the president of the twin association. It's not like being in a church over here. Tell me more about the festival for dead twins. As mentioned, there is a high priestess of the twins. All these women have had twins that have died and they're all chanting and making music with tambourines with old metal plates, and drummers. It is incredible how many there are. They do a sacrifice with Fanta, cookies and candies. They still think of the twins as children, so they give them what children like. This old lady who must have been 80 was singing and chanting all day, for hours, until it was night and completely pitch black. As it was ending, this woman started putting the dolls in this band around her waist. We wondered, was she stealing them? Someone said she had 13 sets of twins and that at least one twin died in each set. What was it like meeting Dah, the high priest, when you first arrived in Benin? Dah Gbedjinon would put his arm around us when he went around saying hello to people in the village as if to say, "these people are under my protection, don't rip them off." He smiled and took me to a bar called The Vatican. We sat for hours. We speak poor pigeon French and he doesn't speak English. We spoke all day about Voodoo, ceremonies and magic, but neither of us speaks each other's language. He invited us to his compound and we sat down. He said "You're like me; you're the Dah of New York." He was wearing a high priest necklace. He gave me one too and put it over my head. Dah was telepathically filtering so we understood each other. You've been to Benin twice, first in January 2014 then in September 2014 for the Vodoun Festival. What made this trip different than the last one? That I got a high priest necklace out of the blue. The bottom is a python and two chameleons. We also found out the last day that [Vodoun] does have a supreme concept of the deity -- it's the meeting of male and female in one. We understood all of that without being told. Can you tell us more about the twin dolls? The dolls look like different people, they each have different expressions. When they're first made, they all look the same. They get expressions during the ceremony. It's very bizarre. They look like the people they would have become in adult form during the ceremony. That was staggering. You bring your doll of Lady Jaye everywhere with you? If she is not around my neck, she's in my purse everywhere I go. We went through a big reminder course of how to feed her and put her to bed. She got another two outfits this time. What are Voudon prayers like? They're so joyful. It's not "oh dear they died." It's "yay we are still with you, we will never forget you!" rather than the oppressive, guilt-ridden fearful thing that's associated with Western religions. What are some of the biggest misconceptions we have in the West about Voodoo/Vodun? It's a very gentle religion based upon communicating and is very much about community. There's no darkness to it at all. It's all about keeping your sense of balance with nature and life. We kept asking them why are there so many twins being born in Benin? It's not genetic. The high priestess agreed to be interviewed for the first time. She said: "They know that we love them whether they live or die here, so they all come here to be born." What a beautiful answer. Is that a horrible, frightening religion? No, that sums up to me the misunderstanding of the West.